Santa claus | Where Outside Is In! You are currently browsing the tag archive for the ‘Santa claus’ tag. This year Reston Town Center celebrated the holidays with Disney Princesses, Humpty Dumpty, Mother Goose, and even the Hungry Hungry Caterpillar! We are excited to announce our largest crowd ever, estimated at around 15 thousand people gathered down two blocks of Market Street! We couldn’t have asked for a more beautiful day and a more thrilling turnout. The day began with the Gingerbread Man Mile Run, a fun run for kids to race around Reston Town Center and then enjoy delicious Gingerbread Man cookies. 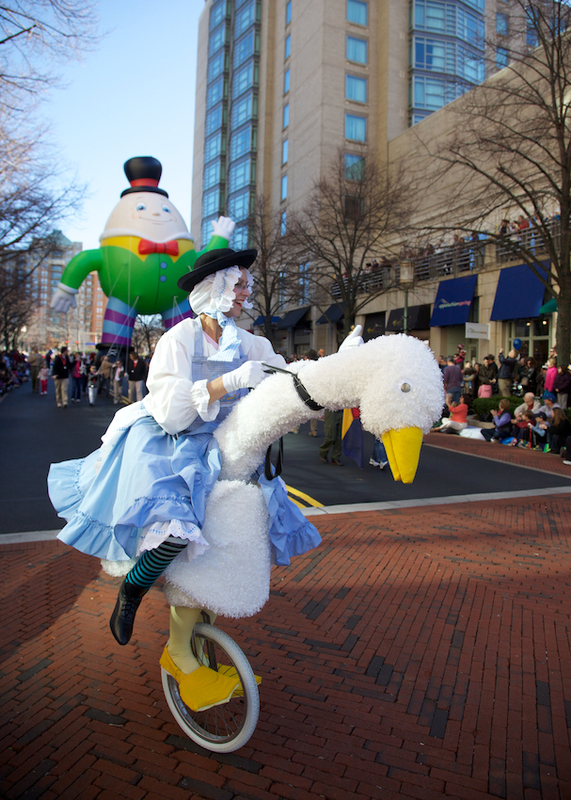 Next was the 21st Annual Reston Holiday Parade celebrating the theme, “Storybook Magic!” Characters from our favorite childhood stories marched, floated, and danced down Market Street alongside community groups, schools, and entertainers. Chili and Carson from MIX 107.3 were the official emcees of the parade, keeping the crowds excited and informed of all the parade participants. Santa Claus was once again the guest of honor, riding through last on his horse-drawn carriage and spreading with him tidings of joy for the new Christmas season. 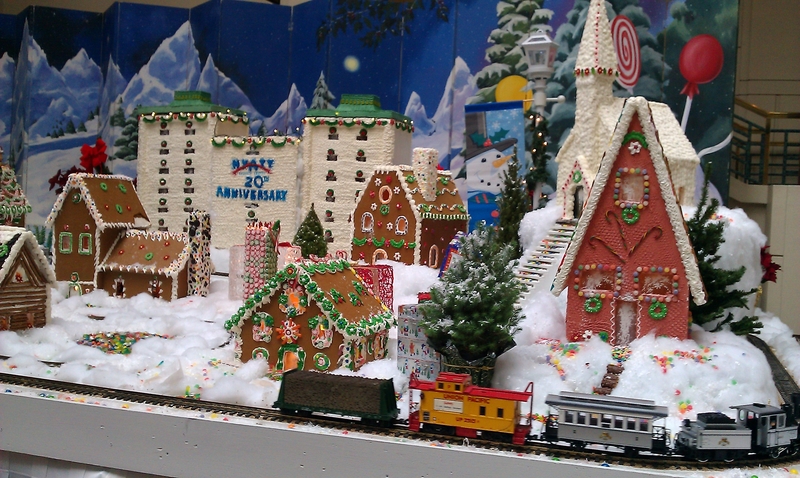 Throughout the day were visits and photos with Santa, Ice skating, and a fantastic Gingerbread Village on display in the Hyatt Lobby! Five days in the making, this delicious creation consists of 145 pounds of sugar, 100 pounds of flour, 2 gallons of molasses and honey, 1½ pounds of cinnamon and nutmeg, 15 pounds of pretzels, and 90 pounds of candy! To round-off the perfect beginning to the holiday season, Santa and Mrs. Claus led thousands of spectators in the lighting of the giant Christmas tree in Fountain Square. With the help of all who believe, Santa lit the tree on the count of three, and then led the crowds along with the Reston Chorale in a holiday sing along. 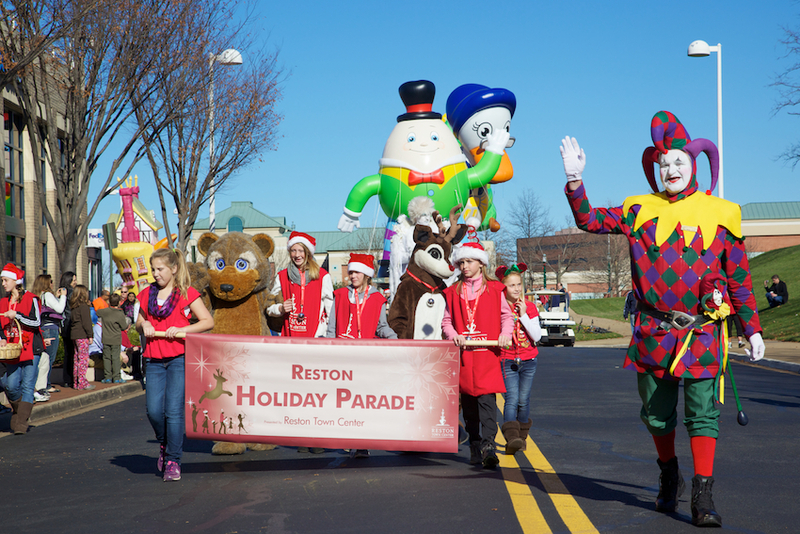 View live footage of the 21st Annual Reston Holiday Parade on Comcast Channel 28 in Reston on December 3,4,10,11,24, and 25 at 11am. Also, view online at www.rctv28.com. Can YOU run like the Gingerbread Man? 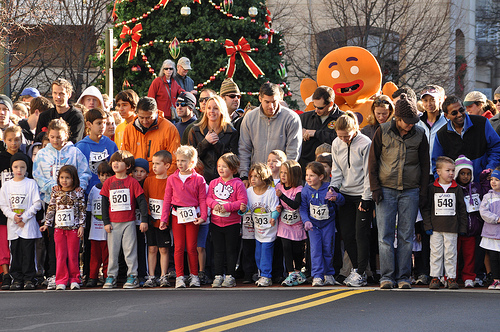 Once you’ve stocked the refrigerator with your turkey and pumpkin pie leftovers, kick off the 2011 holiday season by running the inaugural Gingerbread Man Mile for Kids!, an event that we are sure the whole family will love. Join Potomac River Running and Reston Town Center for a little bit of running and a whole lot of shopping! Registration is FREE and all donations benefit Neediest Kids. Kids can run like the Gingerbread Man at the Kids Mile Fun Run. The course covers a 1-mile loop around Reston Town Center. Once kids finish, they can enjoy delicious gingerbread cookies. After a thrilling morning of tiny tots racing down Market Street, get set for a day full of holiday festivities! Stores open at 8 am for the early Reston Town Center shopper, and the Ice Skating rink is open all day – as is the Hyatt’s giant gingerbread village, on display in the lobby! 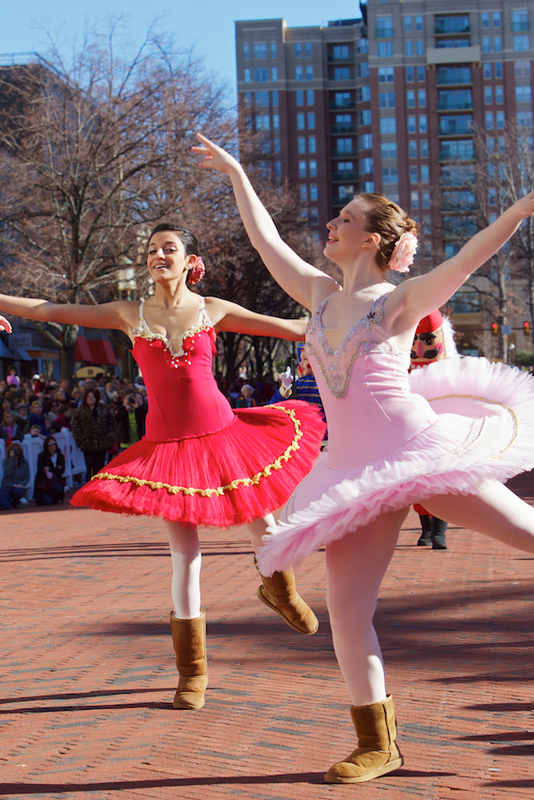 Beginning at 11 am is the 21st Annual Reston Holiday Parade, complete with Macy’s-style balloons, floats, community groups, antique cars, and more! From 12:30-4:30 enjoy visits and photos with Santa. He’ll be checking his list right next to the Skate Shop before heading back out to light up Reston Town Center and the holiday tree at 6 pm. Join him in Fountain Square for the official start of the Holiday Season, sing carols along with the Reston Chorale and hop on board a horse-drawn carriage to round-off wonderful wintry day! 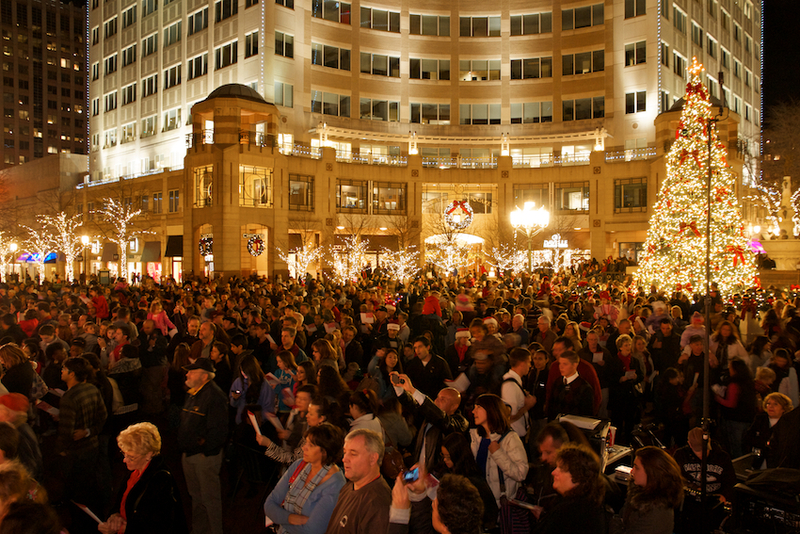 19th Annual Reston Holiday Parade Comes to Reston Town Center November 27th! One of many colorful balloons at the Reston Holiday Parade in 2008. South Lakes High School Marching Band, Langston Hughes Middle School Panther Cheerleaders, Northern Virginia Firefighters’ Emerald Society Pipe Band, Regimental Drums & Fifes of Northern Virginia, Children of the Light dancers, Paul Mitchell School, ArtInsights, F.I.S.H., a team of horses from the Misty Brae Farm Pony Club in Aldie, antique and classic cars from the National Capital Jaguar Club and Mustang Club, Boy Scouts, Girl Scouts, fire trucks, VIPs, including Reston founder Robert E. Simon, Jr., and much more. For event information, visit www.restontowncenter.com, or call 703-689-4699. 8 AM: Run with Alan Webb: 9th annual races for tots to teens to benefit Neediest Kids. Donation of $5 for participation encouraged. Participants can register at www.neediestkids.org. 12:30 – 4:30 PM: Visits and Photos with Santa and Mrs. Claus. Located on Market Street, next to Talbots. Donations will benefit local charities. 6:00 PM: Tree Lighting and Sing Along. Santa and Mrs. Claus will arrive in a horse-drawn carriage to magically light up the Christmas tree, followed by traditional holiday songs led by Reston Chorale and brass quintet. 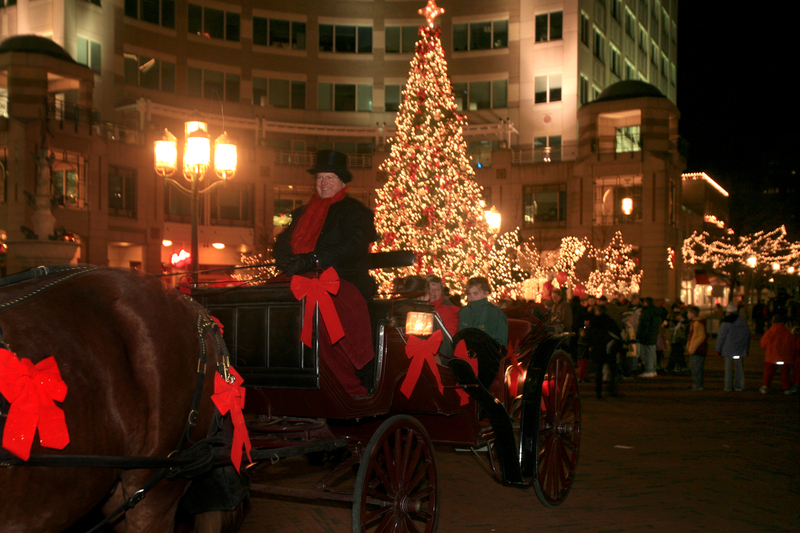 6:30 – 10:00 PM: Horse Drawn Carriage Rides. Proceeds benefit Volunteer Fairfax. Pick-up location is in front of Talbots on Market Street. $5 per person, children 5 and under ride free with adult. All day: Ice Skating Pavilion. Open every day for public skating until March. Santa’s Studio: Santa Claus will be at Reston Town Center in his portrait studio throughout the season. Dates and times vary, November 28 until December 24. His schedule is posted at his location on Market Street next to Talbots, and at www.restontowncenter.com. Holidays are Here! 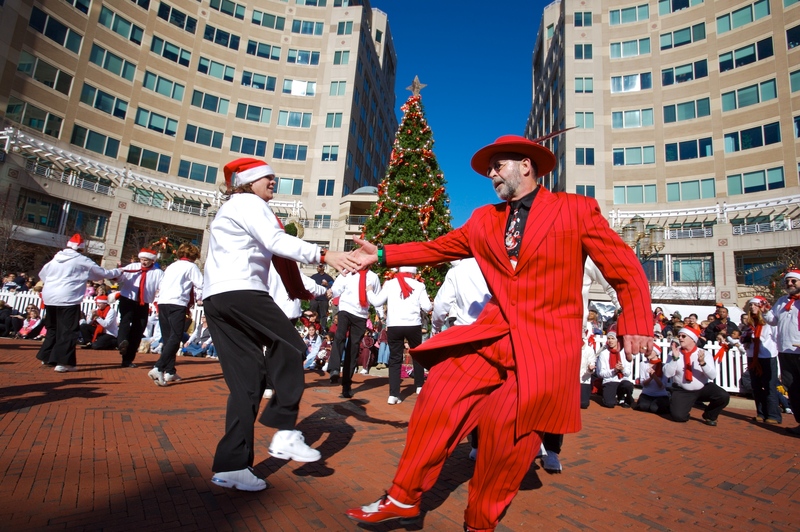 All through December, Reston Town Center will host performances of music and dance by community groups at Fountain Square, and strolling on Market Street. Horse drawn carriage rides are scheduled for Saturday afternoons, December 5, 12, and 19, from 12 PM until 4 PM. All proceeds benefit local charities. $5 per person, children 5 and under ride free with adult. The Ice Skating Pavilion is open every day until March. See the schedules and more details at www.restontowncenter.com. Directions: From I-495, take I-66 west to the Dulles Toll Road (Exit 67, Route 267 West) to Reston Parkway (Exit 12). Turn right on Reston Parkway then left on New Dominion Parkway (4th light).